Sign up to join us! We went to Target today, and of course no trip would be complete without visiting the MLP/LPS aisle I got the unicorn (#1820) and flying deer (#1819) 'Prized Pets' set and my sister got the Kitten Petriplets (#1335,6,7) so I thought I'd share some pics with you. Thanks to Reiya for my avvie! OMG!!!!!! I NEED that pink winged deer, she is the cutest!!!! That Unicorn is cool too but I really need that deer!!! Julie (34) Mom of 6 future MLP collectors! Collector of MLP, Lalas, Bella Sara art, cards, toys, and G2 LPS! MUST GET! I think all of the triplets packs are kind of creepy. The uni and flying deer are a m ust have though. Location: Babysitting all the naughty mods, it is a full time job! That explains why I have seen that same horse and both a horse and a unicorn, lol. Thanks for the pictures and congrats on finding it. Big thank you to Lina and Tuney for my sig & avi! Anyway, I took some pics of them without their accessories. The wings were a bit tricky to get off the deer, and harder to get on because she has such a big head. But it wasn't too bad. The unicorns horn-piece came off really easily though because it's slightly loose on his head but still secure. Fashion Pics here, there, and everywhere! That deer does look kind of like a pig..
Aww, a unicorn! How cool is that. The deer is adorable too! 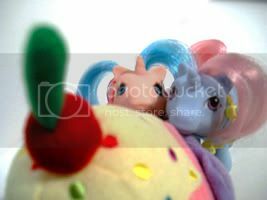 My Emily: My Little Pony + other 80's toys for sale!